We must select the Review tab and then from the far left of the ribbon we located the area named Proofing as shown in the image below. Once we locate the Proofing area of the Review tab, we select the command Check Document as shown below, where we are notified that we Can Check For Spelling, Grammar and Writing Issues. Once we select the Check Document command, at the right of our window the Editor Task Pane appears. In my example below, the Editor task pane shows 8 (eight) Results. We have two main categories that appear that have to do with our Document. First, we have the Category Corrections: The Corrections category is separate in two subcategories. The Spelling, which at the right we notice the Check Mark, meaning that there are no Spelling Issues in our Document. The Grammar subcategory, where at the left we see the number 6 (Six), meaning that we have 6 Grammar Mistakes in our Document. Secondly, we have the Refinements category: The Refinements category is separated in 4 (Four) different subcategories. The Clarity and Conciseness subcategory, where at the left we see the number 2 (two), meaning that we have 2 Clarity & Conciseness errors in our Document. The Inclusive Language, the Punctuation Conventions, and the Vocabulary Choice which all have the check mark at the right, meaning that we have no mistakes. Wherever there is a check mark, meaning that we have no errors in our Document, we do not need to take any actions. Wherever there is a number located at the left of each subcategory, meaning that we have errors in our Document, we need to select that subcategory in order to take action. The Editor task pane will navigate us at that Error in our Document and will give us a suggestion in order for us to correct it. 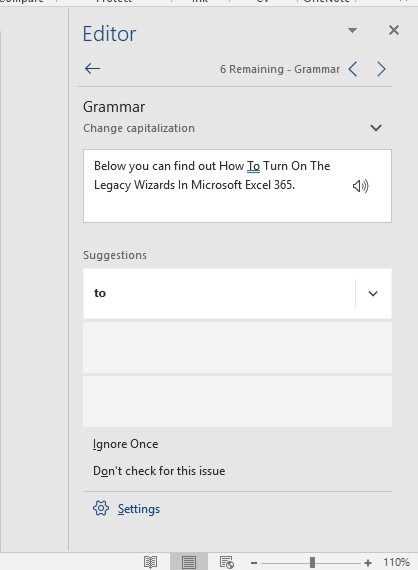 In the image below, we see that we have a Grammar mistake in our Document, and we can also notice the Suggestion, mentioning Change Capitalization. In the middle of the Editor task pane, we can see where our mistake is, and right below we have the Suggestion in what to change the Mistake To. In the next image, I have selected the subcategory Clarity and Conciseness, where the Editor task pane, navigates us to the mistake. Right below, we have the Suggestion, mentioning Consider Using Concise Language and underneath we have the Suggestion in what to change the Mistake To. 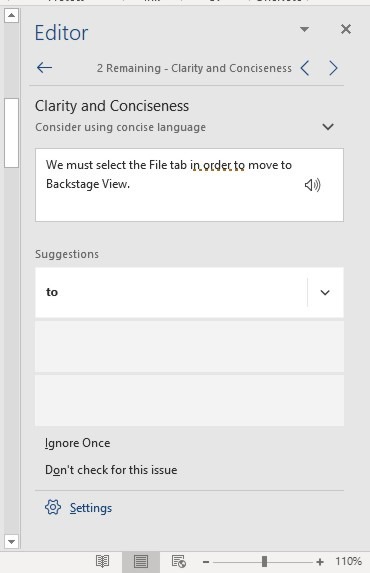 At the bottom of the Editor task pane, we have the options to Ignore Once the mistake by pressing on the command, or the option Don’t Check For This Issue, so we can just ignore the mistake for this occurrence. At the end, we have the Settings command, where if we select it, the Grammar Settings dialog box will appear where we can activate or deactivate commands. That is it! Now, we have an error free from mistakes (any kind) Word Document. 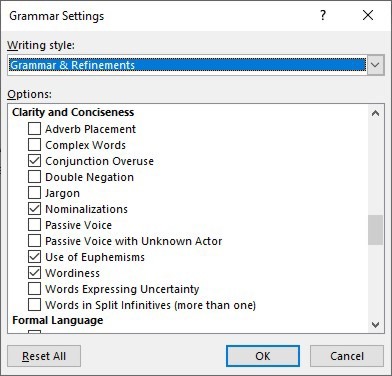 Simple procedure, and easy to work with Editor Task Pane that is available in Microsoft Word. Below you can check out the video describing How To Check Your Document For Grammar, Spelling and Other Mistakes in our Word Document? 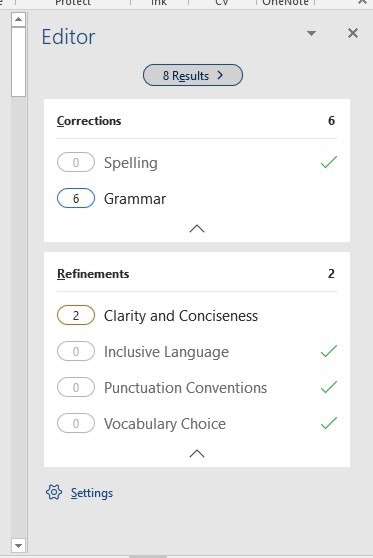 Posted on February 25, 2019, in Microsoft Office 365 ProPlus English, Word 365 English and tagged Category Corrections, Change Capitalization, Check For Spelling, Clarity & Conciseness, Consider Using Concise Language, Conventions, Grammar, Grammar and Writing Issues, Grammar Settings, How To, How To Check Your Document For Grammar, Inclusive Language, Know How, Microsoft Excel, Microsoft Office, Microsoft Outlook, Microsoft PowerPoint, Microsoft Word, Mistake, My YouTube Channel, Office Smart, Office System, OfficeSmart, philippospan, Proofing, Punctuation, Refinements, Review, Smart Office, smartoffice, Spelling, Spelling and Other Mistakes in our Word Document?, Subscribe, Tip & Tricks, Vocabulary Choices, Word Document. Bookmark the permalink. Comments Off on How To Check Your Document For Grammar, Spelling and Other Mistakes in our Word Document?.